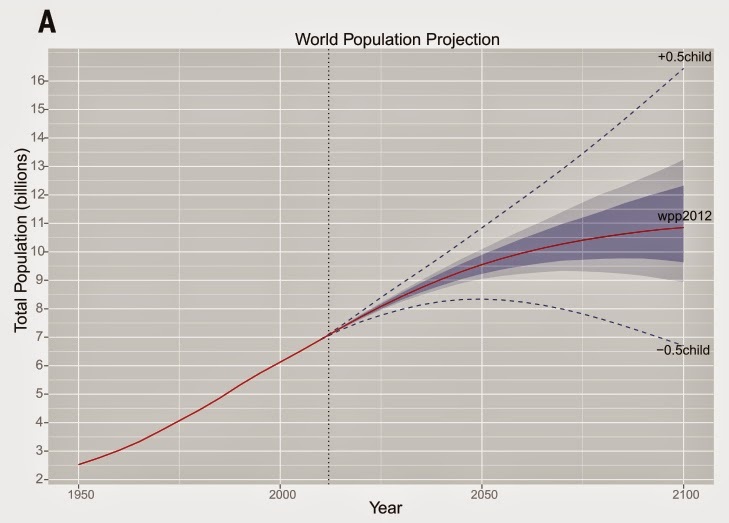 Demographers have been telling us for a while that global populations will level off to about 9 billion, and this "9 billion" number has indeed become the conventional wisdom -- so much so that one of your trusty G-FEED bloggers actually teaches a (presumably excellent) class called "Feeding Nine Billion". With the current global population at just over 7 billion, the belief that population might level off at 9 billion has given some solace to folks worried about the "pile of grain" problem, i.e. the general concern that feeding a bunch of extra mouths around the world might prove difficult. 9 billion people by 2100 implies a much slower population growth rate over the coming century than was observed over the last century, and while a scandalous 800 million people in the world continue to go to bed hungry every night, there has been notable success in reducing the proportion of the world population who don't have enough to eat even as populations have skyrocketed. This success, if you can call it that, has in part to do with the ability of the world's agricultural producers to so far "keep up" with the growing demand for food induced by growing incomes and populations, as evidenced by the general decline in real food prices over the last half century (the large food price spikes in the last 5-7 years notwithstanding). So perhaps David should retitle his class, "11 is the new 9", or, "Feeding 9 billion in the next 20 years", or, "Feeding 11 billion (95% CI, 9 billion to 13 billion)". In any case, these 2+ billion extra mouths are not entirely welcome news for those worried about the global pile of grain. These much larger numbers imply that even greater progress needs to be made on improving agricultural yields if we want to (a) keep prices at reasonable levels and (b) not have to massively expand agricultural land use to do it. Thanks, Gerland et al! My illustrious co-bloggers have documented extensive evidence that extreme heat is bad for crops. We also know that rainfed crops do not appreciate a lack of or too much rainfall. How do we know this? The G-Feed crowd likes to use econometric methods to estimate dose response functions between yields/output and temperature/precipitation. In order to attach a causal interpretation to the estimated coefficients of these dose response functions, one needs "exogenous" (read roughly random) sources of variation in temperature and rainfall. While we know that the distribution of crops across climate zones is not random, day to day changes in weather can be interpreted as random, if one controls carefully for other confounders. We first made this point in a PNAS paper in 2006 and this has been standard practice subject to a number of well understood caveats. 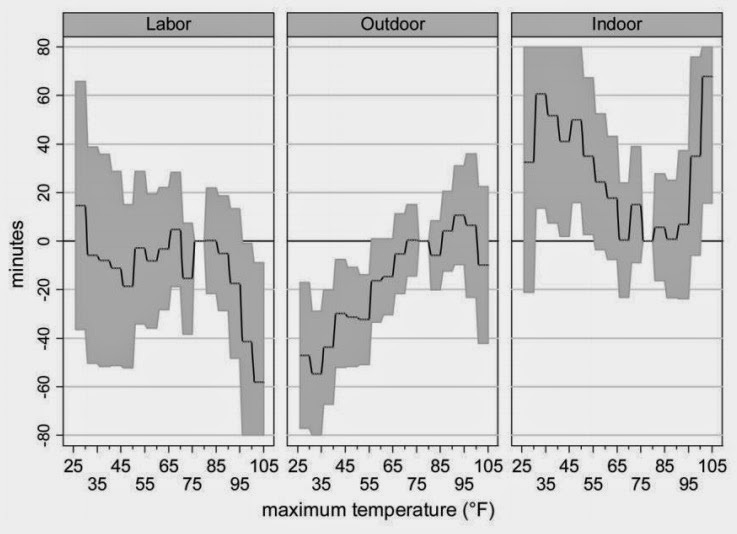 So we know: Extreme Heat=Bad. Too much or too little water = Bad. What we do not understand well so far are the impacts of CO2 on crop yields using non experimental data. There are plenty of studies which pump CO2 into open top chambers of fields and measure differences in yields between carbon fertilized and control plots. What we do not have is a good measure of carbon fertilization in a field setting which incorporates farmer behavior. What has prevented me and arguably many others from attacking this problem empirically is the fact that I thought that CO2 mixed roughly uniformly across space and any variation in CO2 is variation over time. 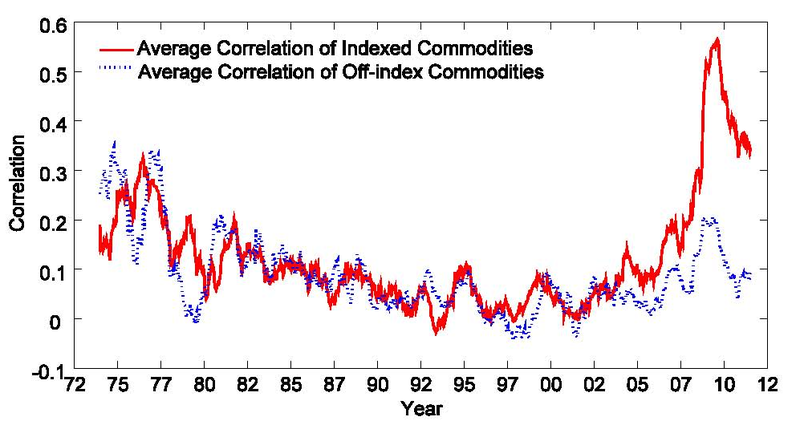 This variation is not useful as one cannot empirically separate the impacts of CO2 from other factors that vary over time, such as prices and business cycles. To talk about poverty and food production as if they are two separate things is to forget that in most of parts of the world, the poorest people earn their livelihoods in agriculture. Increasing productivity of agriculture is almost always poverty reducing in rural areas. The 2008 World Development Report explains this well. Of course, the poor in urban areas are a different story, but that doesn’t change the critical global link between underperforming agriculture and poverty. 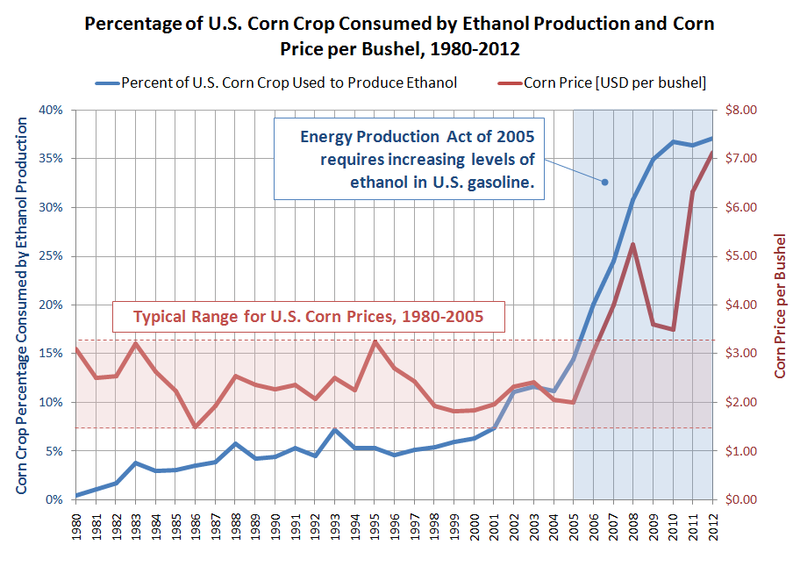 Food prices matter, even if they are low enough that many of us barely notice when they change. If you go to a market, you’d of course rather have hundreds of dollars in your pocket than a few bucks. But if you are there with a few bucks, and you’re spending half or more of your income on food, it makes a big difference whether food prices are up or down by, say, 20%. If you could magically eliminate poverty that’d be great, but for a given level of poverty, small changes in prices matter. 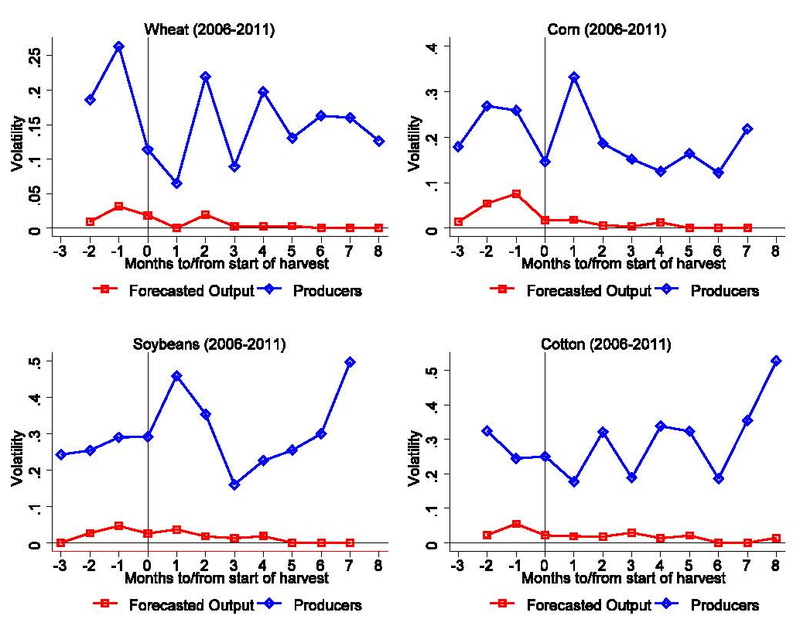 And if productivity of agriculture slows down, then (all else equal) prices tend to rise. Maybe most importantly, there’s no guarantee that past progress on keeping productivity rising and prices low will continue indefinitely, especially if we lose sight of its importance. There’s a great deal of innovation and hard work that goes into simply maintaining current productivity, much less continuing to improve it. Just because many remain hungry doesn’t mean we should treat past successes as failures, or take past successes for granted. And just because we have the technology and environment to feed 7 billion, it doesn’t mean we have it to feed 9 billion (at least not on the current amount of cropland, with some fraction of land going to bioenergy, etc.). Similarly, nobody that I know is actually claiming that the only thing we have to worry about for reducing hunger is increasing crop production. That would be idiotic. So it’s a complete strawman to say that the current strategy to reduce malnourishment is simply to raise yields in agriculture. It’s part of a strategy, and an important part, but not the whole thing. I’m not sure why this strawman persists. I can think of a few cynical reasons, but I’m not really sure. 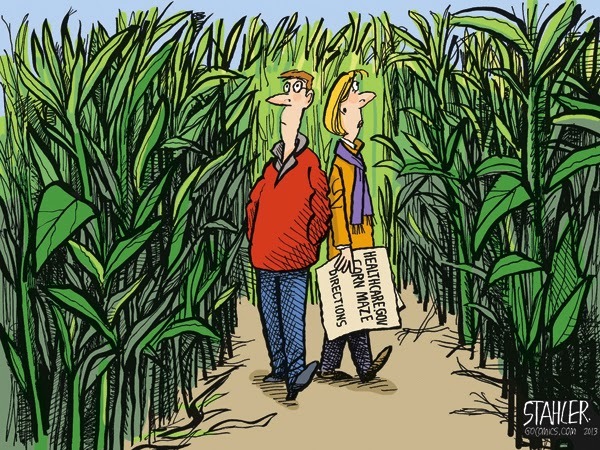 To paraphrase a joke a student told me the other day: there’s really only one good use for a strawman. To drink, man. My colleague (and former postdoctoral mentor! ), V. "Ram" Ramanathan and I have a paper out this week in PNAS (here) on the impacts of short-lived climate pollutants (SLCPs) on Indian crop yields over the past 30 years (1980-2010). Anticipating the publication, the G-FEED crew invited me to guest post this week. Thanks, guys! It's a fantastic opportunity to talk about the paper itself as well as what we know more generally about air pollution and agricultural impacts. I'm biased, but I think this topic is going to be increasingly important in the coming years. 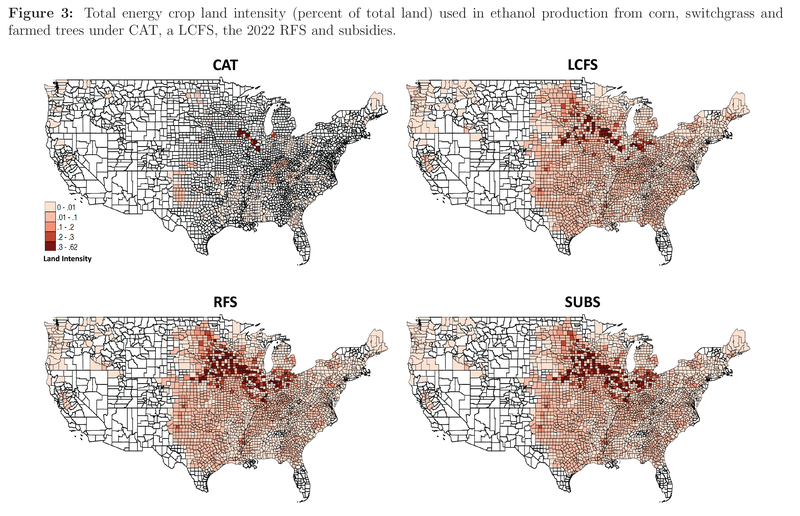 And it feels fitting to discuss it here, as G-FEEDers have been active contributors to understanding the relationship between air quality and crop yields: this work builds on some papers by Ram and Max (here and here), speaks to current work by Wolfram and co. on ozone impacts in the US, and benefitted from feedback from Marshall and David at various points. 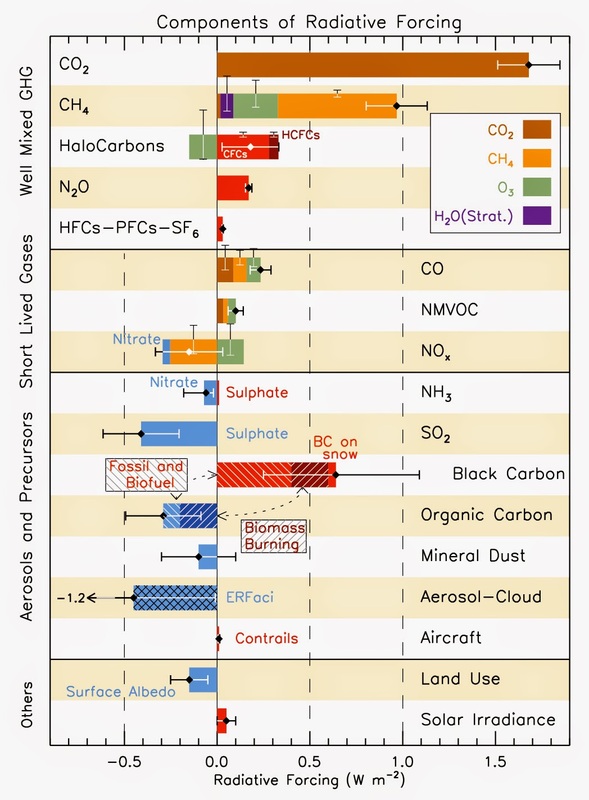 What we do know is this: black carbon is the second or third largest contributor to present warming (after CO2 and perhaps methane, depending on how you partition its impact – it is part LLGHG and part SLCP, since it’s also an ozone precursor). And the four main warming SLCPs combined (BC, tropospheric ozone, methane, and HFCs) have contributed around half of present warming (again, it depends on how you partition methane’s impacts). Moreover, two of these – ozone and BC – have some clear pathways of impact on crops beyond their impacts through temperature and precipitation. Ozone is directly toxic to plants, and BC cuts down on surface radiation, which should negatively impact photosynthesis. And both ozone and BC are very spatially heterogeneous – they are not well-mixed, and so local emissions could very well be expected to have local impacts. So…given these realities we took the unabashedly empirical approach and threw available data at the problem. We ran a panel regression analysis that included growing season and crop-area averaged temperature, precipitation, and pollutant emissions on the RHS, along with various time controls. 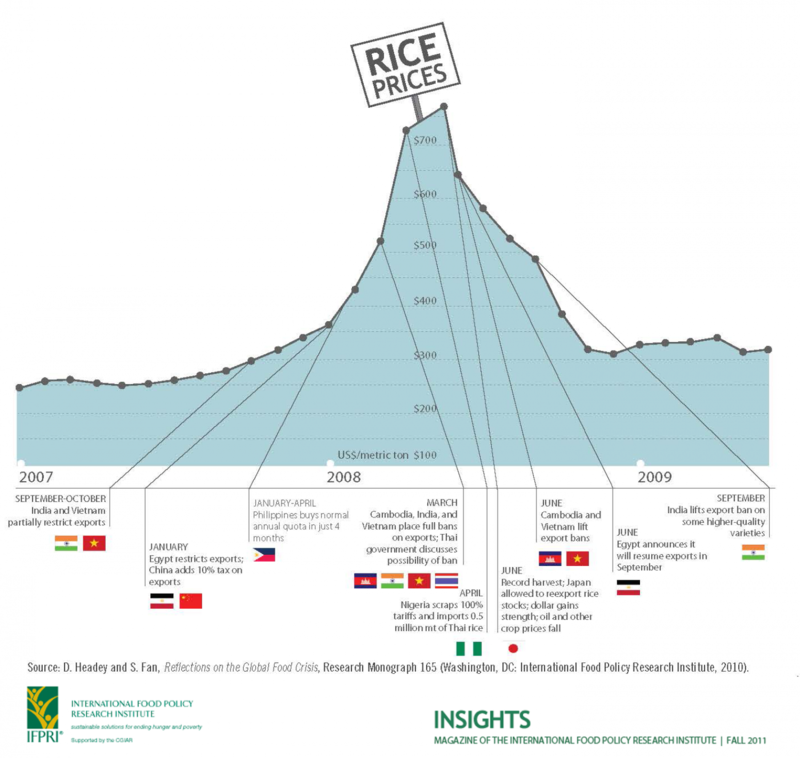 Our unit of analysis was major rice- and wheat- producing states in India, and we looked at data from 1980-2010. 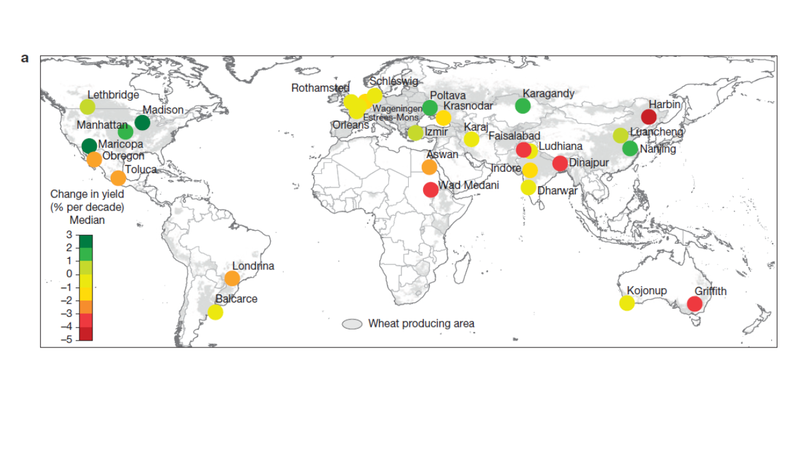 We find that relative yield loss (RYL) for climate and air pollution (weighted average for India) is 36% for wheat. That is, yields in 2010 would have been 36% higher absent climate and pollution trends over the past 3 decades. Moreover, most of that RYL is due to pollution (90%). (Our estimate for rice RYL is 20% but is not statistically significant.) This suggests a few things: first, cost benefit analyses for air pollution mitigation programs will likely look a lot better in a place like India if agricultural benefits are included. Second, in the near term, cleaning up the air could help offset T- and P-related yield losses. How should we think about these results in comparison to previous work? 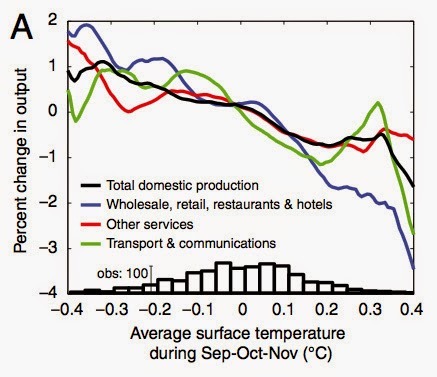 First, what we find in terms of climate (T & P) impacts is slightly smaller than the coarser-scale findings for S. Asia by David and Wolfram et al (here). (They find -5-6%, we have -3.5%.) These are probably not statistically different, but one way to think about this is that, absent pollution variables on the RHS, we’d expect the coefficients for T and P to include some of the impacts of SLCPs. The same holds for the time controls. Wolfram and others have made the case that these panel analyses should include quadratic time trends of one form or another to account for an empirical leveling off of yields. Biophysical limits alone make this a totally sensible proposition, but it’s also likely that the “leveling off” trend that has been observed (more on that by David, here) includes the previously unexplored impact of pollution. 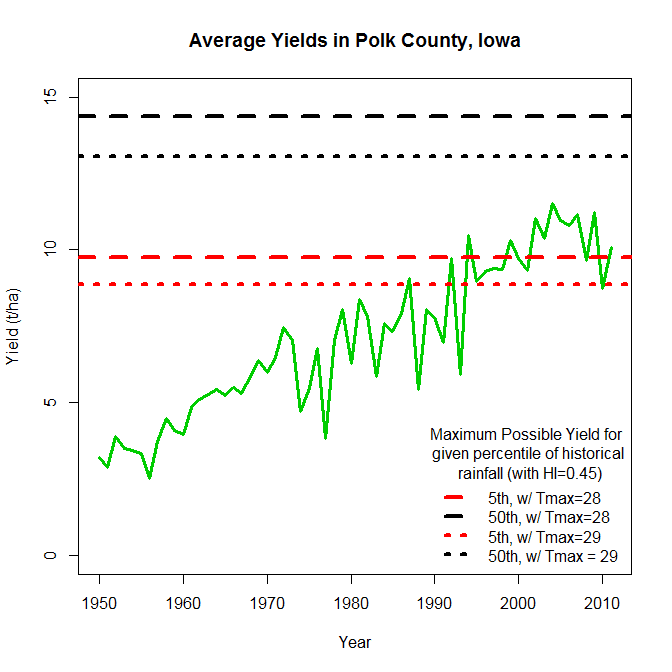 Some previous studies have explored the impact of individual pollutants on yields. 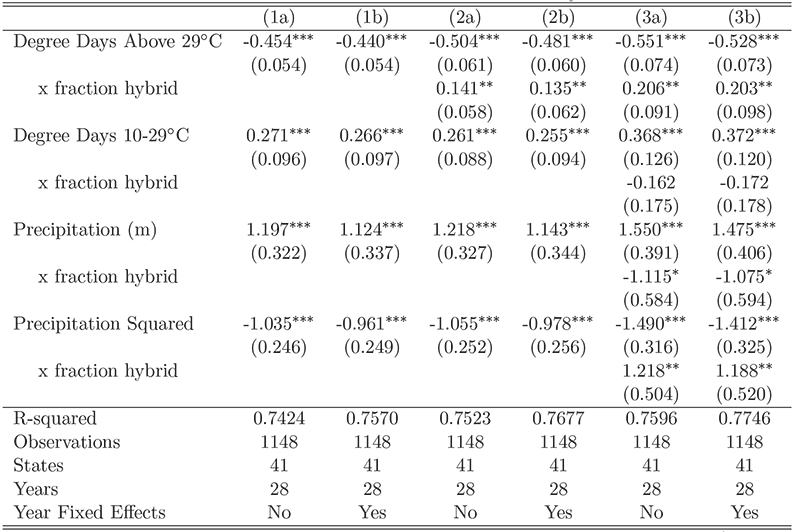 Max et al looked at black carbon indirectly, by examining the impact of surface radiation on yields (here and here). They see the signature of atmospheric brown clouds on precipitation and thus rice yields, but no direct radiative impact. My best guess is that: (1) their metric of total radiation contains a combination of two effects – a reduction in direct radiation from black carbon and an increase in diffuse radiation from scattering aerosols like sulfates. Plants can often use diffuse radiation more effectively for photosynthesis. (2) More important, rainy-season rice is probably the hardest place to see this signal, as precipitation clears particulates out of the air. We put both BC and sulfur dioxide (the main precursor of sulfate aerosols, which are scattering, or net cooling) in our model to account for these two effects independently, and we see significance for BC’s impact on wheat but not rice, as would be expected based on seasonal concentrations. On the ozone side of things, a handful of papers have used atmospheric chemistry models to estimate surface ozone concentrations at a given point in time. Those concentrations have then been used in conjunction with exposure-response (E-R) relationships from test plots to estimate yield losses. In theory, if you really do have a good handle on surface concentrations and a valid E-R function, this would be the way to go. The preferred method is AOT40 – accumulated hours of exposure over 40ppbv. But this number is extremely sensitive to crop cultivar, estimated concentrations, when/how long you count exposure, and other management factors. So these kinds of estimates have very large error bars / uncertainties. (See here, here, here, and here.) A few of those studies suggest RYL in 2000 to be 15%-28% for India for ozone though – a comforting similarity in magnitude. For me, the nice part of this analysis was that we really took a physical approach – we put stuff on the right hand side in forms that made physical sense, and it turned out to hold up to all the (sometimes nonsensical) things reviewers asked us to do. Best of all, the results agree at least in magnitude with some other approaches. I mentioned the competing impacts on radiation from absorbing and scattering aerosols above, but another interesting example is in ozone formation. Ozone depends on both the absolute and relative concentrations of NOx and VOCs. We had evidence (satellite and ground) that we had both types of ozone regimes (NOx-sensitive or NOx-saturated) in our study area. We used the VOC/NOx ratio to account for that; it should probably be standard practice in these kinds of econometric analyses if you’re doing anything involving NOx or ozone. First, we use emissions, and not concentrations, of pollutants. The main reason is that there aren’t any long-run records of pollutant concentrations in India (or most places, for that matter), and we need better satellite-aided algorithms for extrapolating station data to get these kind of reliable exposure maps (the main task consuming my time right now). So we use emissions inventories of aerosols and ozone precursors as proxies for concentrations. Of course, these inventories are also just estimates, and in some cases (e.g., here) have been shown to be wayyy off (particularly low for black carbon). So I’m looking forward to using better exposure proxies. Ideally, one would look at both emissions estimates (the policy-relevant variable), and concentrations (the physically-relevant variable) together. Second, we’re also just statistically limited. Emissions of all pollutants have been going up fairly monotonically, and there’s not a ton of signal there for estimation. Going to smaller scales doesn’t make sense from a physical perspective (then you have to worry about transport). So the best thing to do would be to run this same kind of analysis in different countries. 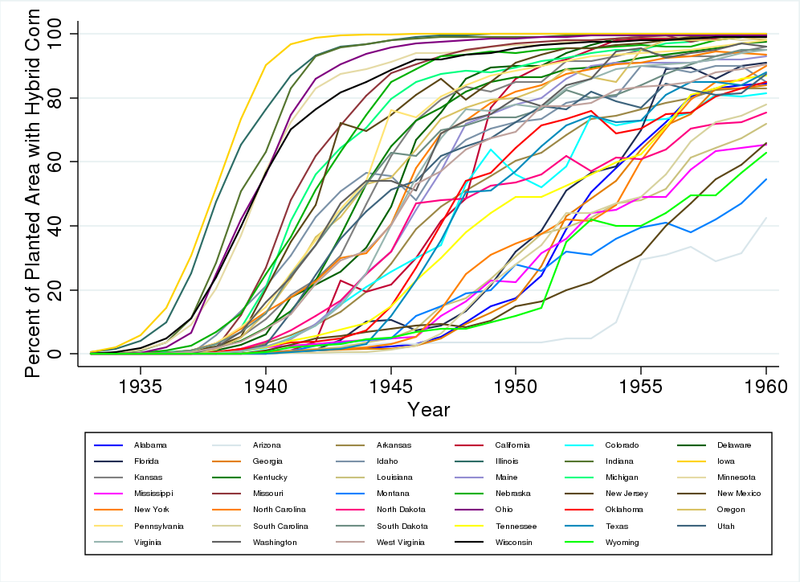 I’m particularly excited to look at different pollution regimes – think biomass dominated versus coal dominated, etc. Hopefully I can convince some G-FEEDers that this would be an awesome collaboration idea (ahem, Sol). I’ll leave off there, though I’m always happy to discuss this stuff if there are any questions. Thanks to G-FEED for having me, and to all of you for reading this tome. We're going to try something new out on G-FEED, which is to invite colleagues for guest posts when they have a new paper that is relevant to the topics we cover. Not only will this help to obscure how infrequently we manage to post, but it will provide some fresh perspectives. And hopefully it's a good chance for people to explain their work in their own words, without having to make a commitment to long-term posting. There is a lot of great work out there, and to paraphrase George Costanza, if you take everything the community has ever done in our entire lives and condense it down into one blog, it looks decent!